It’s been called “a tropical paradise in your mouth.” Thai Cucumber Salad is sweet and tangy, savory and refreshing, and full of DELICIOUS Asian flavor! Home cooks around the world made this recipe go viral, and after taking your first bite you’ll know exactly why. This salad is not only ridiculously simple and irresistibly satisfying, it’s also fast and inexpensive. Cool, tasty, satisfying. 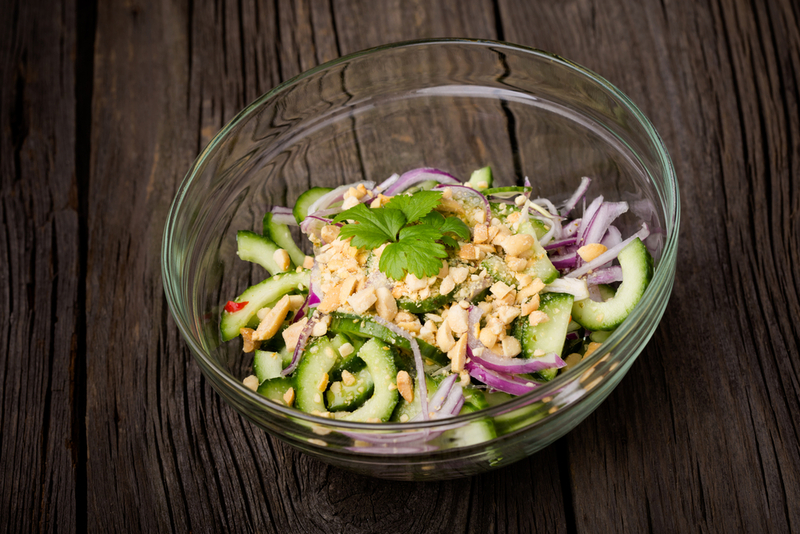 Thai Cucumber Salad is outstanding anytime, but it’s especially nice on a hot summer day. It’s a light and scrumptious salad with super fresh flavors that intensify to an even more delicious level as it sits in the fridge. You can eat it as soon as you’ve made it, however, it’s truly worth the wait if you let it chill in the fridge. Quick, easy, inexpensive. Thai Cucumber Salad is a classic side dish or snack that’s so delicious you completely forget it’s actually healthy. Home cooks love serving it as a side dish with Asian-inspired family meals or preparing a batch to snack on throughout the week.